Fruit crisp? Crumble? We use the names interchangeably in our house for a warm baked fruit dessert topped with an oatmeal, flour, sugar and butter mixture. The fruit combinations are endless! Rhubarb has not always been my favorite fruit, but paired with cherries, it goes from ho-hum to downright amazing. I could eat this for breakfast, but for dessert with a scoop of ice cream it's absolutely heavenly. Frozen cherries are great when fresh aren't available in store or when the prices are higher, and you don't feel like pitting them. I also used frozen rhubarb, but you could likely use fresh fruit and it would be just as good. Make sure you pit them, but do it in a sink or the cherry juice splatter may make your kitchen look like a murder scene! 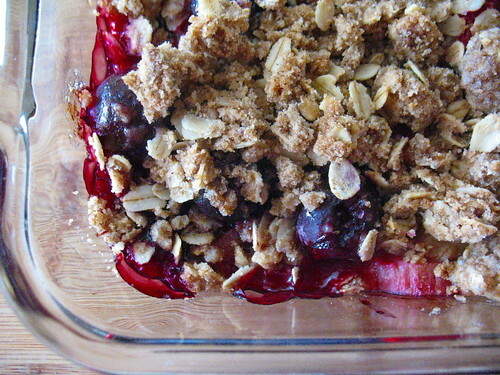 What's your favorite kind of fruit crisp? And do you call it crisp or crumble? In a large bowl, toss together the cherries, rhubarb, sugar, and cornstarch. Put into an 8x8 pyrex glass pan. Set aside. In a small bowl, stir together the flour, oats, brown sugar, cinnamon, and nutmeg. Melt the butter in the microwave and stir into the flour mixture. Sprinkle the oat mixture over the fruit. Bake for 30-40 minutes, until bubbly and the fruit is soft. Let sit for about 20 minutes to cool, then serve with ice cream.